While I was browsing at the Astrolabe on Sparks Street two days ago (which, sadly, is closing down soon), I happened upon this neat photograph of the old Canadian House of Commons, taken in 1898, 18 years before the great fire destroyed the original Center Block and the Victoria Tower. Library and Archives maintains a collection of official photographs of the interior and exterior of the Old Center Block, but this photo does not appear in the official collection. I have therefore decided to share it with you all because of its historical significance. And, if we’re honest, there is probably a significant overlap between those who would find this old photograph interesting and those who read Parliamentum! At any rate, this photograph deserves to be shared with a wide audience. This original Center Block and Victoria Tower originally served as the Parliament of the United Province of Canada and became the Parliament of the Dominion of Canada after Confederation. They were built between 1859 and 1866, though judging by the photos and dates in the Library and Archives’ collection, Victoria Tower gained an upper level and spire circa 1870. 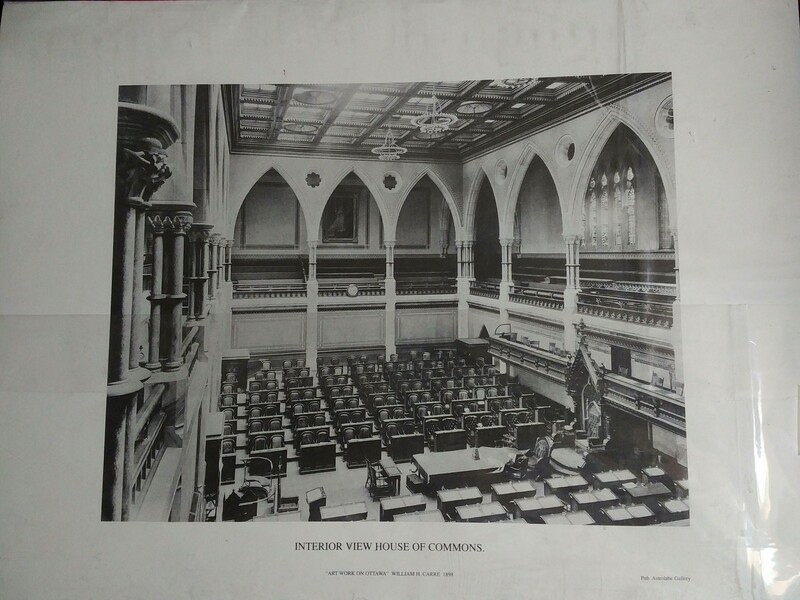 As you can see from Library and Archives’ collection, the interior shots of the Old House of Commons are taken from the government side, to the speaker’s right, and therefore show primarily the opposition benches. But this photograph from 1898 was taken from the opposite vantage point and therefore shows a side of the Old House of Commons that most of us haven’t seen before. I thought that the Old House of Commons is in the Uncanny Valley with respect to the current House of Commons; it looks somehow at once familiar yet also strange and unusual. The Old House of Commons was rotated 90 degrees relative to the New House of Commons, so it was wider than it is long. Based on the over-exposure in this and the Library and Archives’ photos, we can see that the Old House of Commons had skylights. Six chairs on the government side look more ornate than all the others, and I suspect that the Prime Minister sat in the chair furthest to the left in this photograph. If that is true, then the Prime Minister and Leader of the Opposition would have sat opposite each other and between the Clerks’ Table, whereas they sit well behind the Clerks’ Table in the New House of Commons. The Speaker’s Throne looks more ornate as well. Most interestingly of all, the famous portrait of Queen Victoria, which now rests outside the main entrance to the Senate along with portraits of our other sovereigns and which was saved from the Great Fire of 1916, appears in the background of this photo in the galleries. In a way, the Commons is an odd place to put the Sovereign’s portrait, given the convention and parliamentary privilege that the Sovereign cannot enter the House of Commons! Please let me know in the comments what other interesting things you observe. Merry Christmas! This entry was posted in History of British North America, Parliament, Traditions and History. Bookmark the permalink. My goodness is it weird for the Speaker’s Chair to be against the long wall. I can’t ever recall seeing that in any other chamber. There are now too many MPs for the current chamber, and the number should be proportionately reduced to about 290. Although it may seem odd for the Sovereign’s portrait to be inside the Commons chamber based upon Westminster tradition, this reflects Canada’s reverential treatment of our Monarchs, and our special unique relationship with Queen Victoria which is reflected in the BNA Act. Queen Elizabeth II’s portrait hangs inside the Alberta Legislative Assembly right behind the Government. I’m very glad that someone in 1916 thought to save priceless artifacts like this portrait. I’m extremely glad that the Library, Senate chamber and John A.’s original Office were not lost. Thank you for sharing this photo. It was very interesting indeed! I have never actually seen such a clear and well positioned photo of the Old Chamber before, so it was nice that you put this up. I hope you do not mind that I reblogged this post on my own website (which has a similar aim and scope of your own site). I used a current photo of the Chamber as the featured image and it is interesting to see the difference between the two. I find it interesting that the Old Chamber was rather plain compared to the new. It does not appear that there is a lot of dressing done to the stonework like what we have today. The current Chamber, as I am sure you already aware, has symbols of our national history and identity and I cannot make that out in this photo of the Old Chamber if that is present. Also, I find it interesting how small the Chamber is, makes me wonder how we would have coped with this Old Chamber today with a much larger House of Commons. Perhaps we would have ended up a la the UK with less seats in the House than actual members. Thanks again for sharing and please keep up the great work. It is refreshing to see more people interested in the history, law and customs of the House of Commons and Parliament as a whole. Good point re: the size of the Old House of Commons. The website on the history of the Old Center Block, run by PWGSC, said that the Victoria Building was expanded after 1905 in order to accommodate new MPs from the newly-created provinces of Alberta and Saskatchewan. So if the original Victoria Building had survived the 20th century, we would certainly have needed to renovate it and expand it extensively.